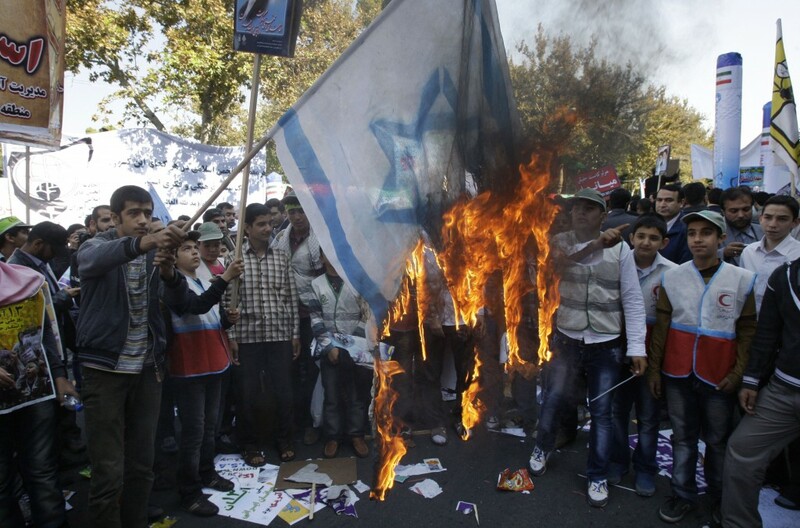 As he spoke, Iranian students outside the former embassy building chanted “Death to America” and “Death to Israel” and burned US and Israeli flags. Naqdi’s speech was in keeping with the defiant rhetoric that Iran’s leadership often uses during the annual rallies marking the embassy seizure. He also said Iran would only restore diplomatic ties with the United States if Washington disbands the CIA and removes its bases from the region. The rally marked the Nov. 4, 1979 storming of the embassy by militant Iranian students who held 52 Americans hostage for 444 days to protest America’s refusal to hand over the toppled Iranian shah Mohammad Reza Pahlavi back to the country for trial. Washington severed relations with Tehran after the embassy takeover, and they have not been restored since. This year’s demonstration in Tehran, which under the Persian calendar fell two days ahead of the anniversary according to the Western calendar, comes as Iran’s relations with the West are at their lowest yet. Concerns are also rising as Israel has threatened to strike Iran’s nuclear facilities if Tehran doesn’t stop uranium enrichment — a process that can be a pathway to nuclear arms. The West suspects Iran is using its civilian nuclear program as a cover to develop atomic weapons. Tehran has denied the charges, saying its program is peaceful and geared toward generating electricity and producing radioisotopes to treat cancer patients. Iran has been hard hit by intensified US and European Union economic sanctions meant to curb the suspect nuclear program. Ordinary Iranians have felt the bite of the sanctions and the Iranian rial has plummeted in value against the dollar, a slide that has accelerated over the past month. At Friday’s rally, students brandished an effigy of US President Barack Obama and distributed pamphlets denouncing America and the sanctions. 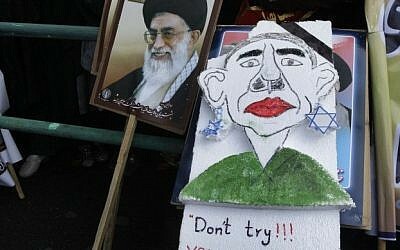 One banner called Obama a “loyal dog” of Israel, with a caricature showing the US president with a metal chain around his neck linked to an Israeli flag. The former embassy is now painted with anti-Amercan murals and used as a training site for Guard troops. Naqdi, who commands the Guard’s paramilitary branch known as the Basij, set his own “conditions” for resumption of diplomatic relations with the US in a speech to the crowd. The US, he said, must abolish the CIA, pull out its warships from the Persian Gulf and dismantle its military bases in 50 countries around the world if it wants to restore ties with Tehran. Iran blames the CIA for helping topple the country’s elected government in the 1950s and it blames the United States for openly supporting the late shah against the Islamic revolution that led to the collapse of the dynasty. Iranians also condemn Washington for arming and supporting former Iraqi dictator Saddam Hussein during the 1980-88 Iran-Iraq war. “They (the US) must prove they’ve grown into sensible human beings and stop supporting the usurper Zionist regime,” said Naqdi, expanding on his list of conditions. 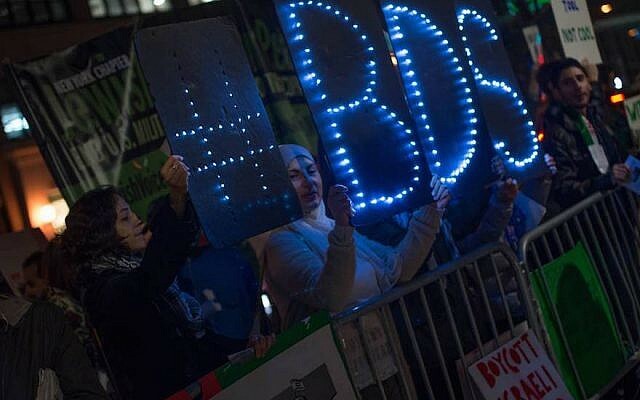 A statement released by the organizers of the event said the US will remain Iran’s “No. 1 enemy and the Great Satan,” a term commonly used by Tehran to vilify Washington.